Carré des Feuillants is one of my favorite restaurants, in no small part due to chef’s Alain Dutournier’s uncanny ability to match food and wine. The stellar service you would expect at a highly renowned spot, a sophisticated but not stuffy atmosphere and one of the world’s best restaurant wine lists makes it easy to hope for frequent return trips. While the Ville Lumière boasts an almost endless array of fine restaurants, there are those that stand out more than others. 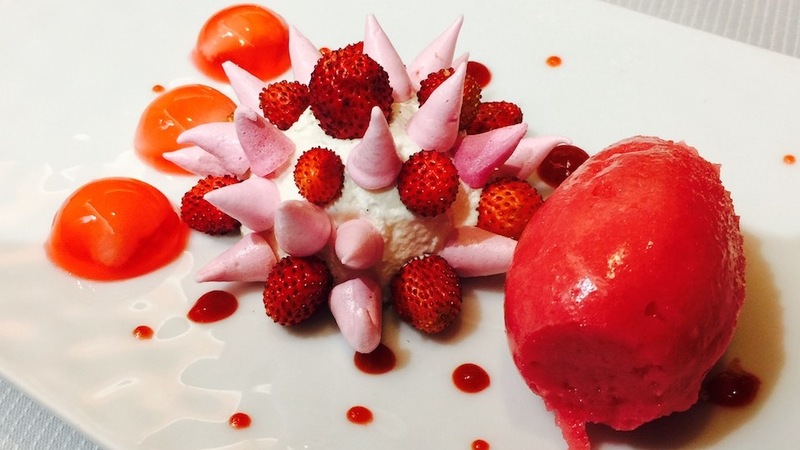 Carré des Feuillants is without question one of Paris’ brightest dining spots. Located near the beautiful Place Vendôme and housed in an ancient convent built during the reign of King Henry II (1519-1559), there’s lots to like. For example, the modernist, minimalist, brightly colored and brightly lit, reasonably quiet (but not especially large) dining rooms designed by Albert Bali, the impeccable, highly professional service, and one of the world’s truly great (and I mean great) restaurant French wine lists. Sophisticated but not stuffy, the single greatest thing about Carré des Feuillants is head chef Alain Dutournier’s ability to match food to wines, so this is one place where you really do want to ask the sommeliers for wines to pair with the dishes you’ll have picked on the night. You won’t be disappointed with the result. The cuisine harkens back to that of France’s south-west, and though you’ll find nods and winks to Bergerac and Gascony in many of the dishes (Dutournier himself, white mustache and longish hair, would look very much at home in the part of a swashbuckling senior musketeer), it speaks very much of the Landes, the French department situated between Bordeaux to the north and the French Pays Basques to the south. Though traditional at heart, the recipes have been tweaked and updated with a contemporary flair, such that the final renditions of each are light and airy. Undoubtedly, this is one temple of French haute cuisine where you can eat at your heart’s content and not walk away feeling bloated or heavy. 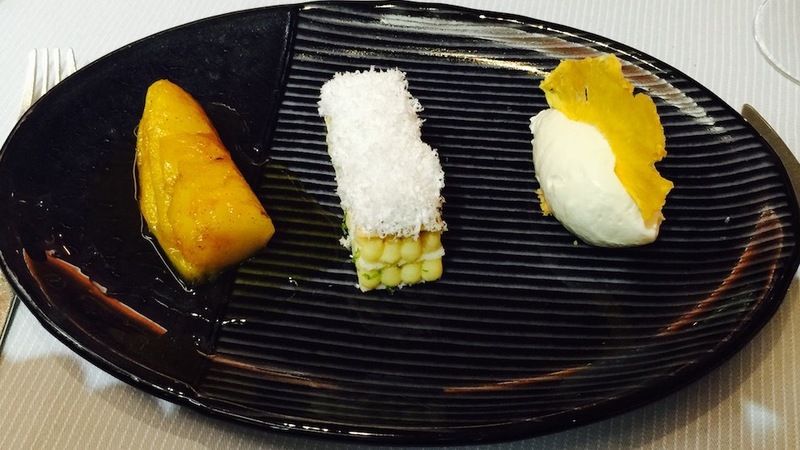 Dutournier sources very fresh ingredients, combining and arranging them as parts of a triptych on each plate. Hence his menu reads as a series of threes: for example, Caille des prés, truffe, foie gras, but a longer subtitle beneath each entry on the menu explains further what the dish is all about: in this case, the “Wild quail, truffle, foie gras” is followed by “Rossini-style quail in a pastry shell, pear chutney, truffle tapenade, and hazelnut crumble” which helpfully gives diners more info to work with. Once again, my latest meal at Carré des Feuillants ran very smoothly and almost too quickly (always a good sign) revealing noteworthy cooking ability, impeccable technical mastery and creativity. If I really had to pick one favorite dish amongst the many I tried, I would have a hard time; perhaps the quail, or the farm chicken, two of the more interesting dishes I’ve had so far this year. Carré des Feuillants boasts a wine list that knows few peers. Certainly La Tour d’Argent in Paris boasts an even greater wealth of great French wines, but after that, Carré des Feuillants is up there with the best of the best. Many verticals from all regions of France only add to the dining pleasure, as does the option of trying many lovely wines from little known French wine regions. Clearly, the panoply of older vintages only adds to the restaurant’s charm and reputation. Last but not least, both the wine list and the menu are available on the restaurant’s web site, which allows diners to do their homework ahead and not spend what could well be hours in trying to decide what to drink on the night. This time around, my wine choices couldn’t have left me happier. Trimbach’s 2001 Riesling Clos Ste. Hune is a classic, and a very fine result in a slightly difficult year (grey rot was a problem). Currently drinking very well, this is one white wine that greatly benefits from decanting, so do go ahead and give it a good hour or so in a carafe. Candied lime, underbrush, spicy ginger, baked bread and quince are only some of the aromas and flavors that emerge with aeration, all complicated by notes of chamomile and truffle. Another wine that is currently at its peak is the smooth, rich and round 1999 Chablis Les Clos Grand Cru from René and Vincent Dauvissat. With a very long finish that speaks of crushed stones, earth tones, potpourri and lemon, it is a beautifully complex Chablis that lingers long and bright on the finish. There’s really not much to gain by holding on to this any further, though it certainly isn’t going to die anytime soon. Next up are two absolutely delicious light red wines that prove perfect foils for my main courses, which are based on white meat and fish (chicken and red mullet). The 2015 Château de Bachelards Comtesse de Vazeilles Le Grand Vin and 2014 Château de Bachelards Comtesse de Vazeilles Fleurie Le Clos are refined, juicy and vibrant reds from Alexandra de Vazeilles, a relative newcomer to the Beaujolais region. Made from organic grapes (Ecocert certified 2009) and biodynamic farming practices (Demeter certified 2015), with the consulting help of French mega-star consultant winemaker Stéphane Derenoncourt since 2014, both reds prove to be outstanding in their own way. Le Grand Vin, a Gamay-Syrah blend is the deeper and richer of the two, with a captivatingly pure and intense violet aroma, while the Fleurie Le Clos, from 80-100 year old Gamay vines planted in a 1.84 hectare large walled vineyard characterized by mainly pink granite soil, is softer and readier to drink. 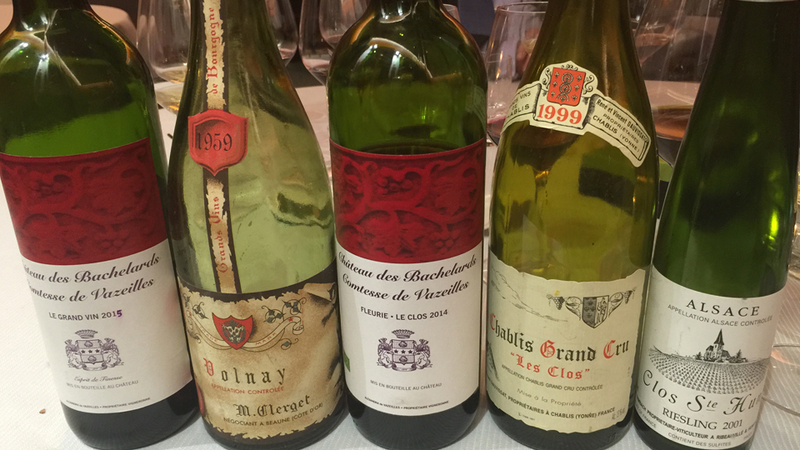 It showcases just how truly exciting and memorable great Beaujolais cru wines can be, but seldom are. Last but not least, the 1959 M. Clerget Volnay is a magnificent wine, offering an utterly beautiful bouquet of delicate floral, sweet spice and red and blue fruit aromas that have an enticing pristine quality. Bright but harmonious acidity lifts and extends the refined herbal, licorice, red fruit flavors on the long, bright, suave back end. An extremely well kept bottle that is a source of huge pleasure, this dainty but precise, racy, Volnay didn’t give away all it had to say until it was almost sixty years old. At Carré des Feuillants, guests can close out their meals with a great bottle of wine, as I chose to, or continue on to an almost endless list of distilled spirits (there are something like hundreds of Armagnacs alone to choose from). Either way, it won’t be hard to find an excuse to linger on just a little longer in this true temple of high gastronomy.